The D harmonic is derived from dividing the open bottom E string into 7 parts. It occurs halfway between frets 2 and 3 but a little bit more towards fret 3. 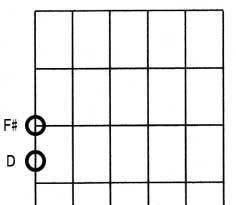 This D harmonic also appears just below fret 6 , just below fret 10 and halfway between frets 14 and 15. The F# harmonic is found right over the 2nd fret and derives from dividing the string into 9 parts. This harmonic can also be found at fret 14.